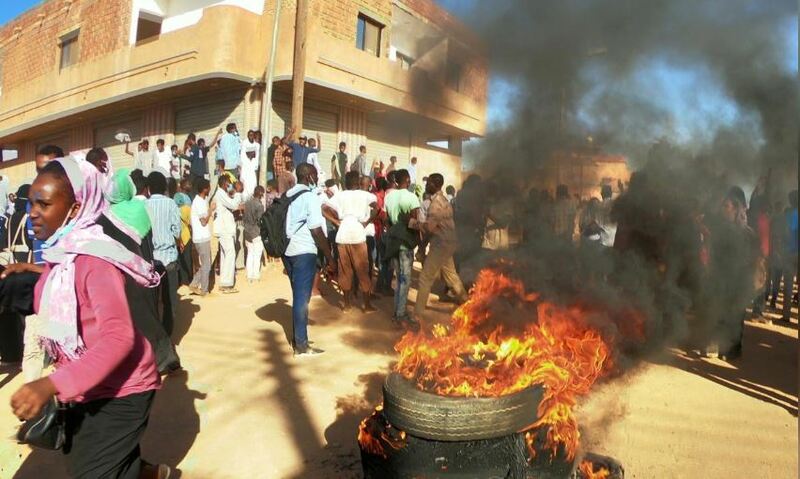 Sudan protesters clash with police in ongoing unrest - SABC News - Breaking news, special reports, world, business, sport coverage of all South African current events. Africa's news leader. Sudanese demonstrators burn tyres as they participate in anti-government protests in Omdurman, Khartoum, Sudan. Sudanese police fired teargas on Tuesday at hundreds of protesters blocking roads, burning tires and chanting anti-government slogans in and around the capital Khartoum as month-long protests continued unabated. Demonstrators have been on the streets near-daily since December 19, initially to protest against an economic crisis then to call for an end to the 30-year rule of President Omar al-Bashir. In Omdurman, across the Nile from Khartoum, smoke could be seen rising from burned tires and tree branches, with the sound of the main rallying cry for Bashir’s fall: “Down, that’s it”. In the north of the capital, protesters blocking a main road in one of the most populous neighborhoods chanted: “How much does a martyr’s blood cost?”, witnesses said. Police fired teargas to try and disperse crowds in both places, chasing protesters into side-streets, witnesses said. “We will continue to protest so we can fulfill the goals of those who died, the martyrs,” said a 36-year-old housewife who asked not to be named. The official death toll from the month of unrest stands at 26, including two security personnel. Earlier on Tuesday, police also fired teargas at dozens of protesters gathered in Omdurman near the home of a man whose family said had died of wounds on Monday after he was shot at an anti-government protest last week. Bashir, who has blamed the unrest on foreign “agents” and rebels from the western region of Darfur, was travelling to Qatar on Tuesday. This entry was posted on 23 Jan 2019,05:53AM at 5:53 AM and is filed under Africa, Homepage Latest Stories Slider. You can follow any responses to this entry through the RSS 2.0 feed. Both comments and pings are currently closed.